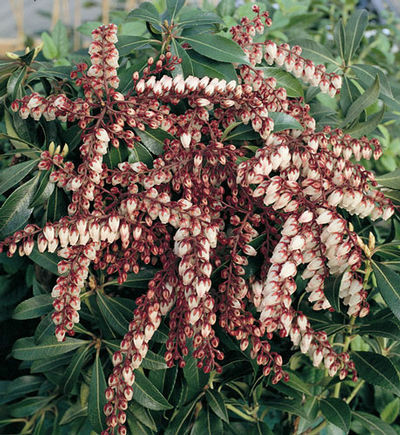 A strong growing compact shrub that blooms heavy with dark red buds that open to pale pink. Its new foliage is reddish changing to medium green in summer. Excellent as a focal point in any landscape or can be planted as a small growing hedge. This vigorous grower is one of the nicest forms available. We offer Dorothy Wycoff 18" to 24" in a 5 gallon container. Blooms late winter into spring. A native of Asia and Japan and is often referred to as 'andromeda' that orginated from an earlier genus name for the plant. Fertilize in the spring after blooming with a food for acid-loving plants. Can be harmful if injusted by people or animals. Nice dense rosette-like foliage, spreading branches on this broadleaf evergreen makes it an attractive landscape specimen. Rich bronze-red new growth changes to lustrous dark green at maturity. Cascades of urn-shaped white to pink slightly fragrant flowers cover the plant in March and April and last for 2 to 3 weeks. Buds form during the summer for the next season’s blooms.